The Disney Pixar hit, Planes, was undoubtedly a hit, a truly adorable movie. I’m excited to tell you that there is another movie coming on it’s heels: Planes: Fire & Rescue. Check out the trailer below. 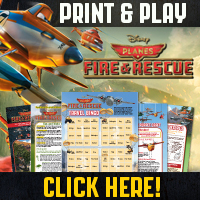 PLANES: FIRE & RESCUE soars into theaters on July 18, 2014! I know this over a year ago– But it worth repeating– Its one of our favorites. We had to see it three times, If that wasn’t enough. I haven’t seen a Pixar movie I didn’t like , we can watch them over and over.